that helps produce chemical reactions in the body. substances, producing important chemicals for the body, and other important functions. 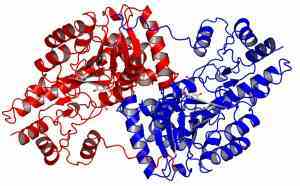 WHAT DOES ASPARTATE AMINOTRANSFERASE SPECIFICALLY DO? glutamic acid. Amino acids are groups of chemical substances that form proteins. are essential to the body's structure and function. HOW DOES AST DO ITS JOB? levels to assess liver functioning. WHAT IS THE NORMAL LEVEL OF ASPARTATE AMINOTRANSFERASE IN THE BLOOD? substance that is needed to produce a desired effect. A unit's value will differ for each type of substance. more than one quart, 4 liters of milk is a little bit more than one gallon of milk. WHAT CAN CAUSE THE LEVEL OF ASPARTATE AMINOTRANSFERASE TO BE TOO HIGH? producing important chemicals for the body, and other important functions. heart attack, recent or severe liver damage, shock, or a large decaying tumor (a type of abnormal tissue). the body, and other important functions. of life, that is capable of existing by itself. Red blood cells help carry oxygen to the blood. clot. The condition can be life threatening because it can lead to the inability to breathe. functioning and chemical processes in the body to take place. HOW LONG DOES ASPARTATE AMINOTRANSFERASE REMAIN AT A HIGH LEVEL? WHAT CAN CAUSE THE LEVEL OF ASPARTATE AMINOTRANSFERASE TO BE TOO LOW? WHAT CAN CAUSE ASPARTATE AMINOTRANSFERASE LEVELS TO BE INACCURATE? WHAT ELSE IS ASPARTATE AMINOTRANSFERASE CALLED? oxaloacetic transferase (SGOT), aspartate transaminase, and glutamic-aspartic transaminase.